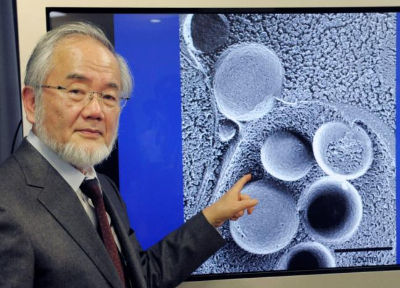 Japan's Yoshinori Ohsumi has won the 2016 Nobel Prize in Medicine for his ground-breaking experiments with yeast which exposed a key mechanism in the body's defences where cells degrade and recycle their components. Ohsumi's discoveries have led to a new paradigm in the understanding of how the cell recycles its contents. His uncovering of the “mechanisms for autophagy” has the potential to tackle diseases such as cancer and dementia. The Nobel Prizes and the Prize in Economic Sciences (which was added to the Nobel Prizes in 1968, but was not in the will of Alfred Nobel) have been awarded 567 times to 889 recipients, of which 25 awards (all Peace Prizes) were to organizations. Due to some recipients receiving multiple awards, the total number of recipients is 860 individuals and 22 organizations. The top five countries with the most Nobel laureates are all western nations - with the United States, the United Kingdom, Germany, France and Sweden topping the rankings. The United States has had the most Nobel Prize winners, with 336 winners overall. It has been most successful in the area of Physiology or Medicine, with 94 laureates since 1901. It tops the rankings for all prizes except Literature. The United Kingdom has majority of its 117 Nobel laureates winning in Chemistry and Physiology or Medicine. The dominance of Western countries is to be expected, due to the huge sociopolitical power these nations have held over the last century. The divide among gender is worse - with just five per cent Nobel Prizes being awarded to women. Why does he deserve the Nobel? Ohsumi's discoveries heralded a new paradigm in our understanding of how the cell recycles its content. Until Ohsumi came on the scene in the 1990s, scientists thought that cells had a dumping ground for waste, but not the sophisticated recycling centre that Ohsumi discovered. His discoveries opened the path to understanding the fundamental importance of autophagy in many physiological processes, such as in the adaptation to starvation or response to infection. His pioneering work gave the rest of the scientific community the tools they needed to explore autophagy, transforming it from a niche area to one of the most popular in biology. Ohsumi has provided scientists around the world with critical tools to help them understand how disrupted autophagy can contribute to illnesses including infectious diseases, cancers and neurodegenerative diseases such as Huntington’s and Parkinson’s. Dysfunctional autophagy has been linked to Parkinson’s disease, type 2 diabetes, cancer and a host of age-related disorders. Intense research is underway to develop drugs that can target autophagy to treat various diseases. From when are scientists working on decoding the process of autophagy? The term ‘autophagy’, derived from the Greek meaning ‘eating of self’, was first coined by Christian de Duve over 45 years ago, and was largely based on the observed degradation of mitochondria and other intra-cellular structures within lysosomes of rat liver perfused with the pancreatic hormone, glucagon. The mechanism of glucagon-induced autophagy in the liver is still not fully understood at the molecular level. In recent years the scientific world has ‘rediscovered’ autophagy, with major contributions to our molecular understanding and appreciation of the physiological significance of this process coming from numerous laboratories. Although the importance of autophagy is well recognized in mammalian systems, many of the mechanistic breakthroughs in delineating how autophagy is regulated and executed at the molecular level have been made in yeast. It wasn’t easy to study yeast, primarily because their cells were so small that a systematic study seemed difficult. One mystery that remained was how the cell ditched and recycled larger protein complexes and wearied organelles. That's where Ohsumi's experiments come into play. Where did Ohsumi's experiment lead to a breakthrough? 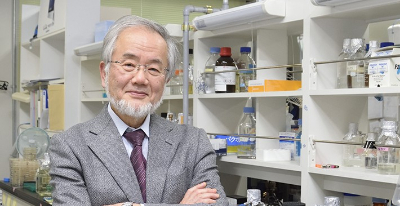 Yoshinori Ohsumi had been active in various research areas, but upon starting his own lab in 1988, he focused his efforts on protein degradation in the vacuole, an organelle that corresponds to the lysosome in human cells. Yeast cells are relatively easy to study and consequently they are often used as a model for human cells. They are particularly useful for the identification of genes that are important in complex cellular pathways. But Ohsumi faced a major challenge; yeast cells are small and their inner structures are not easily distinguished under the microscope and thus he was uncertain whether autophagy even existed in this organism. Ohsumi reasoned that if he could disrupt the degradation process in the vacuole while the process of autophagy was active, then autophagosomes should accumulate within the vacuole and become visible under the microscope. He therefore cultured mutated yeast lacking vacuolar degradation enzymes and simultaneously stimulated autophagy by starving the cells. The results were striking. Within hours, the vacuoles were filled with small vesicles that had not been degraded. The vesicles were autophagosomes and Ohsumi's experiment proved that authophagy exists in yeast cells. But even more importantly, he now had a method to identify and characterize key genes involved this process. This was a major break-through, and Ohsumi published the results in 1992. 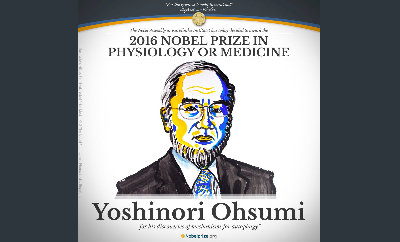 Yoshinori Ohsumi is a Japanese cell biologist specializing in autophagy, is a professor in Tokyo Institute of Technology's Frontier Research Center. Ohsumi was born on February 9, 1945 in Fukuoka, Japan. He received a B.Sci. in 1967 and a D.Sci. in 1974, both from the University of Tokyo. As has been the case with many Nobel laureates, even Ohsumi floundered at first, trying to find his way. He started out in chemistry but decided it was too established a field with few opportunities. So he switched to molecular biology. But his Ph.D. thesis was unimpressive, and he could not find a job. His adviser suggested a postdoctoral position at Rockefeller University in New York, where he was to study in vitro fertilization in mice. “I grew very frustrated,” he told the Journal of Cell Biology in 2012. He switched to studying the duplication of DNA in yeast. 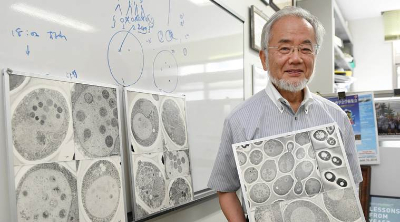 That work led him to a junior professor position at the University of Tokyo where he picked up a microscope and started peering at sacks in yeast where cell components are degraded — work that eventually brought him, at age 43, to the discoveries that the Nobel Assembly recognized now. Dr. Ohsumi later moved to the National Institute for Basic Biology, in Okazaki, and since 2009, he has been a professor at the Tokyo Institute of Technology. 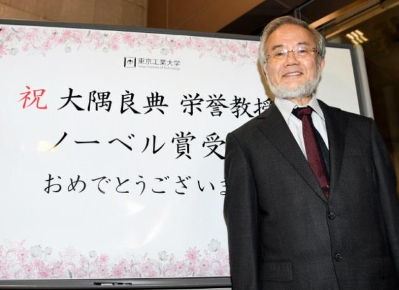 Even after his retirement on 2014, he still continues to serve as Professor at Institute of Innovative Research, Tokyo Institute of Technology until now. Currently, he is head of Cell Biology Research Unit, Institute of Innovative Research, Tokyo Institute of Technology. How does autophagy even matter? Autophagy controls important physiological functions where cellular components need to be degraded and recycled. 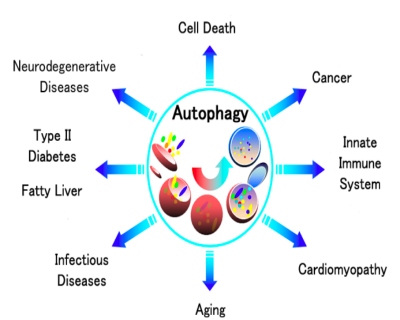 Autophagy can rapidly provide fuel for energy and building blocks for renewal of cellular components, and is therefore essential for the cellular response to starvation and other types of stress. After infection, autophagy can eliminate invading intracellular bacteria and viruses. 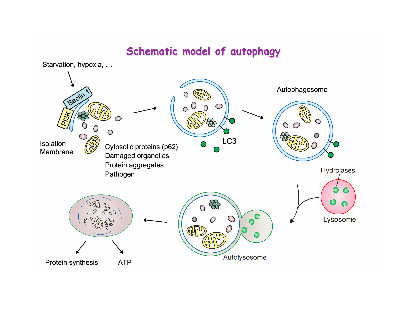 Autophagy contributes to embryo development and cell differentiation. Cells also use autophagy to eliminate damaged proteins and organelles, a quality control mechanism that is critical for counteracting the negative consequences of ageing. Disrupted autophagy has been linked to Parkinson’s disease, type 2 diabetes and other disorders that appear in the elderly. Mutations in autophagy genes can cause genetic disease. Disturbances in the autophagic machinery have also been linked to cancer. Intense research is now ongoing to develop drugs that can target autophagy in various diseases. Ohsumi’s experiments offered a peek into the mysterious process of autophagy. The process however is yet to be properly understood.